Hey! We've reached 1000 page views! Thank you everyone! Thus, in celebration of #1000, I'm going to try something a little different: a giveaway. 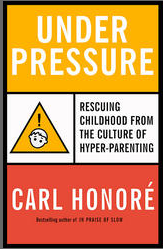 The prize is Under Pressure: Rescuing Our Children From The Culture of Hyper Parenting by Carl Honore. In it, the author argues that in many places today, based on research from North America, Europe and parts of Asia, the culturally normative style of parenting is... well, too much. Too much structuring, too much managing, too much buffering, too much shadowing. And the result? Children who are stressed, stifled and dependent --the opposite of what we as parents are striving for. It's an intelligent and thoughtful book, filled with insights and examples of how we can "lighten up" on our children, and it's a really good read, to boot. So, rather than buying it from a bookstore, one reader will receive Under Pressure from me, free! How, you ask? Leave a comment on this post below (you don't have to log in, sign up or anything). Offer in your comment a "Realistic Parent" insight, or something your parents did that you thought was really smart, or anything positive you'd like to share. On Thursday, September 13, 2012 (new date!) I'll ask Ms. Random Generator to pick the lucky winner! So check back to see if that winner is you! Thank you all so much for reading and for sharing your thoughts and stories with us!